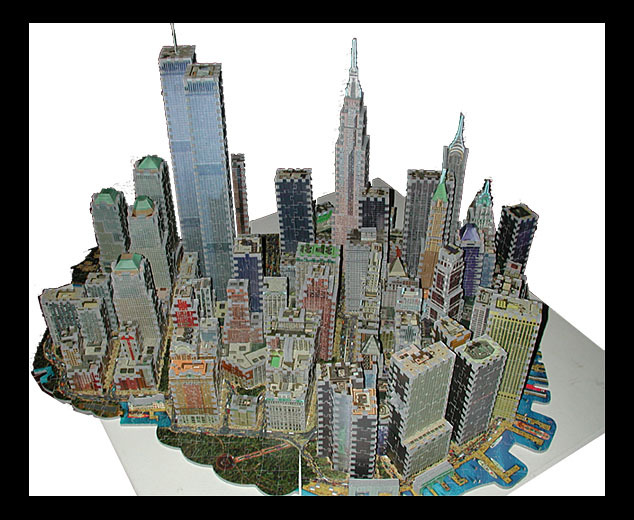 The Puzz-3D New York, New York puzzle has 3141 pieces, is labeled as super challenging, and measures 35”x26”x21.25” (WxDxH). 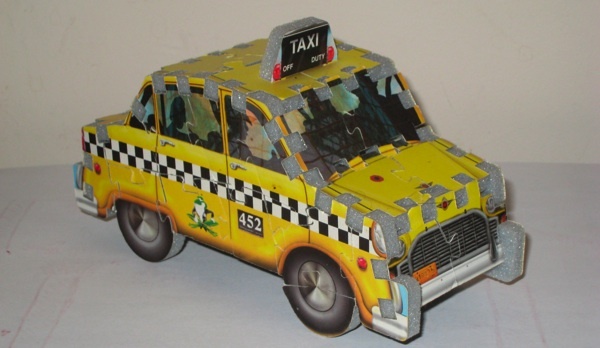 It’s made by Wrebbit, who make a wide range of 3D puzzles. 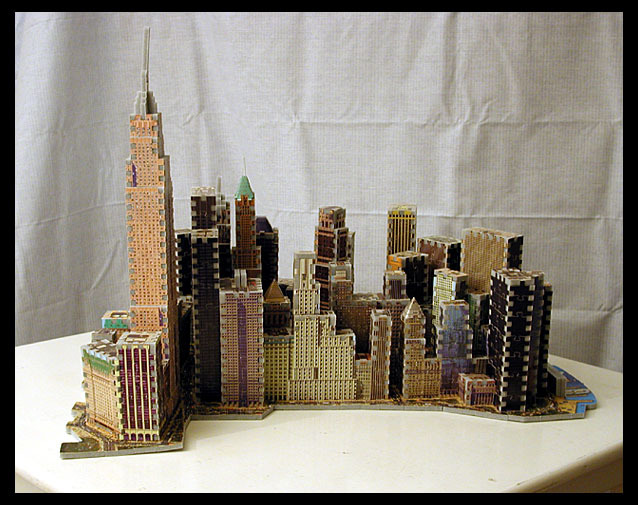 The Puzz-3D NYC is really two separate 3D puzzles that you combine into one huge one. 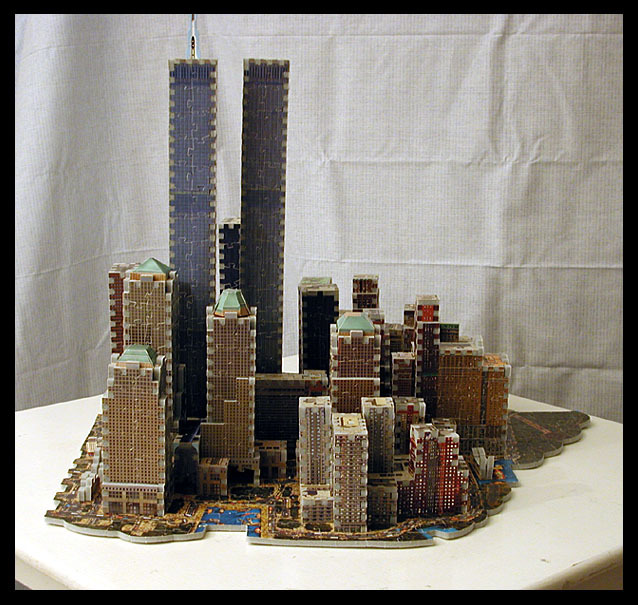 The first section is the World Trade Center district, which contains the World Trade Center, the World Financial Center, One Liberty Plaza, the Monument of Merchant Marines, Battery Park, Castle Clinton Fort, and the Athletic Club, to name a few. 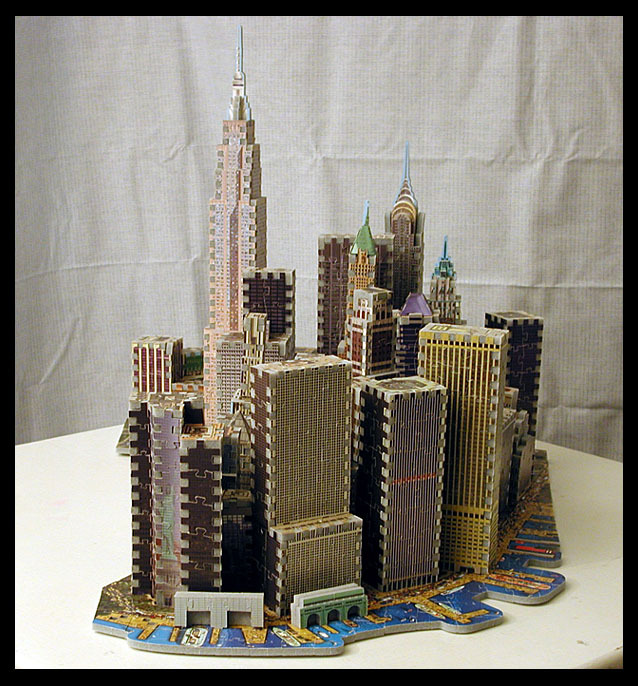 The second section is the Empire State Building district which contains the Empire State Building, the Marine Midland bank, the Chrysler Building, the old Manhattan Bank, the American Standard Building, Morgan Bank, the Chase Manhattan Bank, the Equitable Building, and Standard Oil. 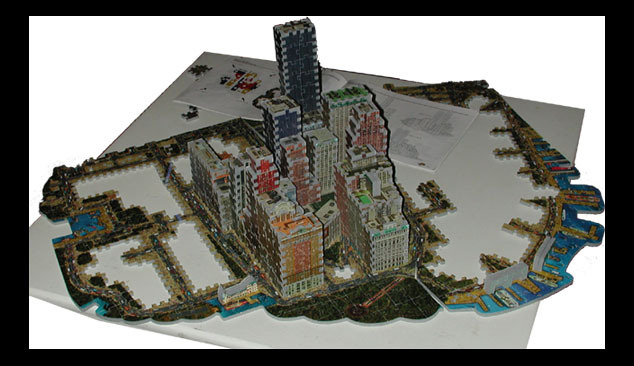 The instructions mention that it also comes with 39 extra pieces that will “enable you to construct a surprise element, typical of the Big Apple.” I like a little extra mystery in my puzzles (if you want to see the surprise, here’s a pic). This is the official start day of this puzzle. I moved my little kitchen table out to the living room, which is where I’ll work on the puzzle. 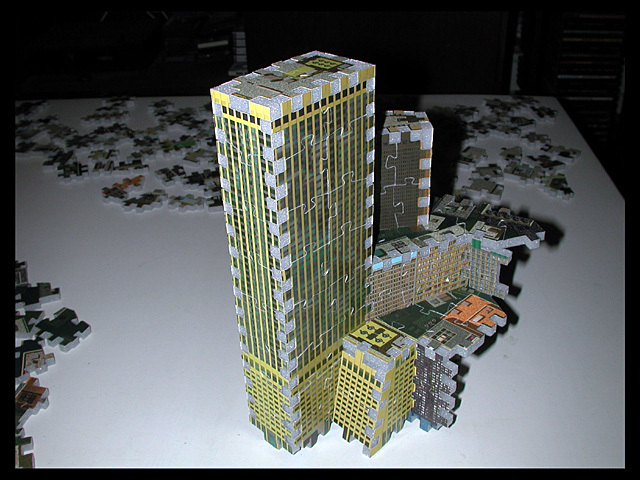 There seems to be three types of pieces: “base” pieces which make up the base of the puzzle, and closely resemble the traditional flat style puzzle – they are mainly street pieces; “roof” pieces which are obviously the roofs of the buildings; “structure” pieces which are the meat of the puzzle and make the puzzle 3D – they are mainly pieces that make up the buildings. The assembly guide is 27 pages long, and is quite detailed. 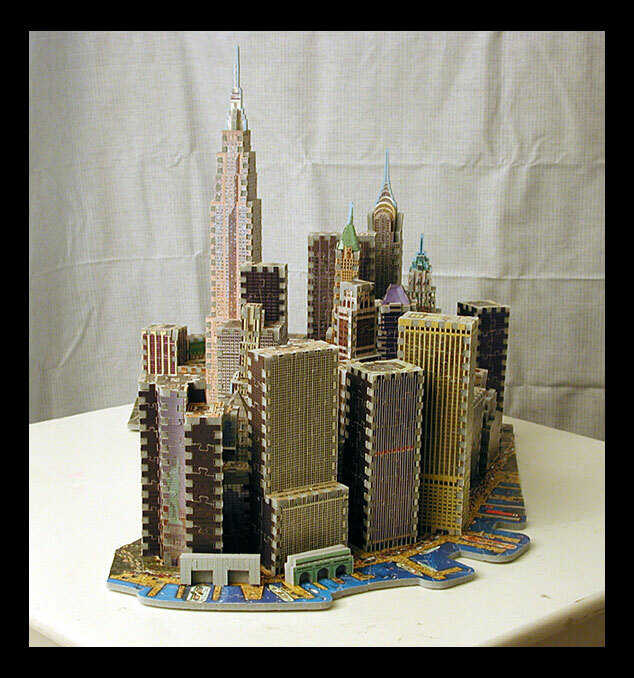 It starts off with a little tour of New York as depicted in the puzzle. The first thing the assembly guide instructs you to do is to remove all the “dot” pieces. The “dot” pieces each have a little red dot on them, and are mainly little &frac14” squares inside of larger pieces that don’t need to be there (obviously the cutting machine couldn’t remove them). The instructions are very clear: “do not throw away any red-dot pieces until your puzzle is completed!”. 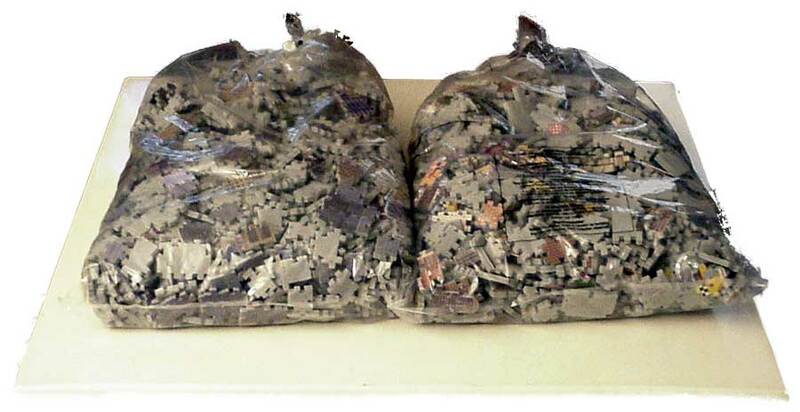 I went through both of the large bags and pulled out as many of the “dot” pieces that I could find, and put them in a small bag. 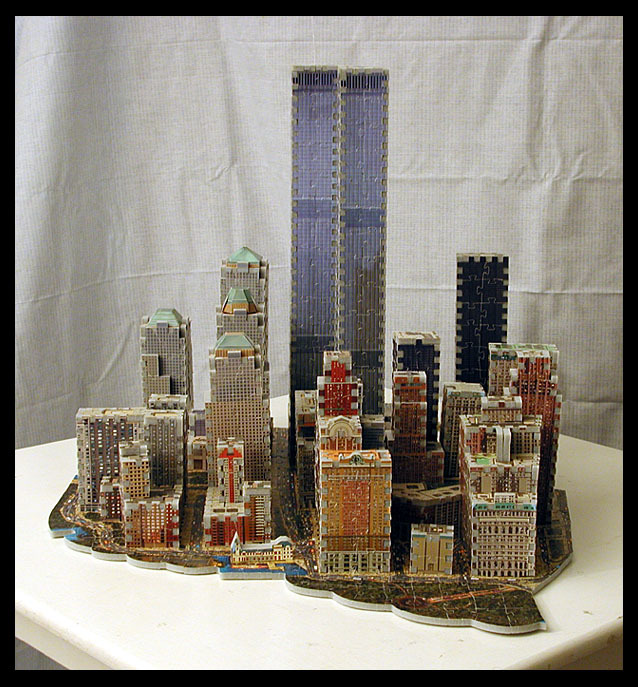 Most of them had to be pulled apart from the normal puzzle pieces. I also pulled out as many of the “base” pieces that I could identify (they largely have streets, cars, and water on them). I also found several pieces that obviously have nothing to do with buildings or the street pieces – must be part of that surprise element. After pulling out as many of the street and roof pieces that I could find and placing them in separate bags, I started going through the “building” pieces. I noticed that a few pieces seemed too have similar color/pattern composition, so I put them on the table in a little pile. After a little while, I was able to piece a few pieces together. It’s a start. It looks like this is how it’s going to go for a little while. I spent this week in Las Vegas, so I didn’t work on the puzzle. During this time, I have been going through the two bags full of pieces trying to find pieces that match the color/pattern of groups that I have laid out on the table (unfortunately, I had a disk crash and did not have a good backup of the pictures that were taken at this time). 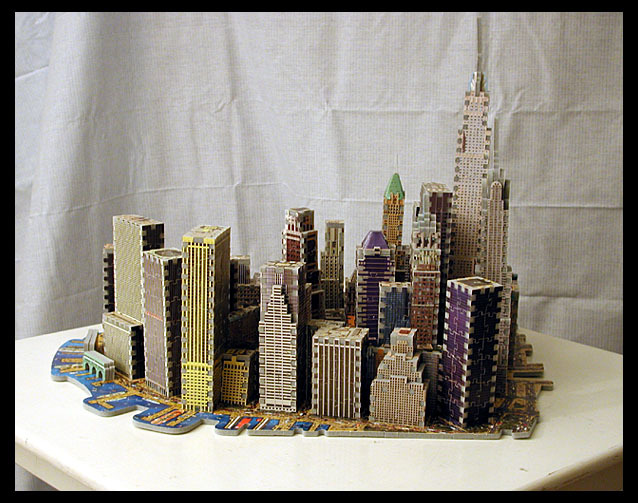 By the end, I somehow managed to put a lot of buildings together. I needed a lot of help, and the assembly guide came through. 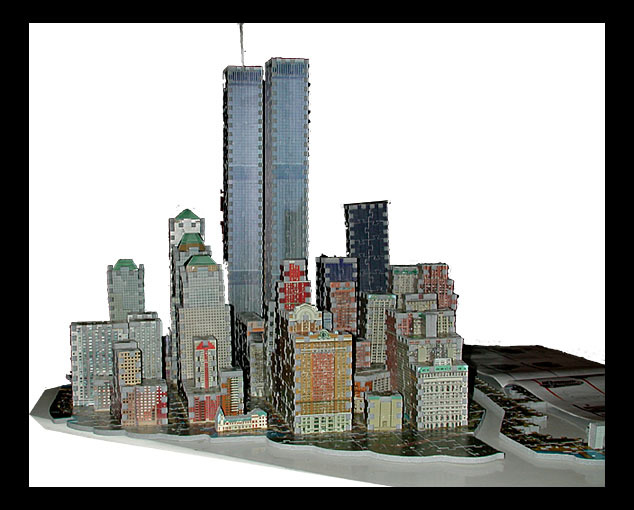 For example, the World Financial Center has four buildings, and the color/pattern of them are all the same. 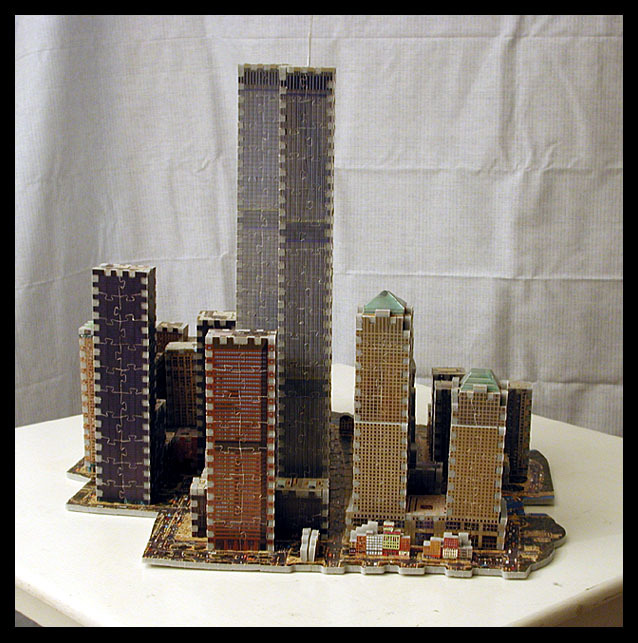 The assembly guide has detailed photos and a piece outline of each building. 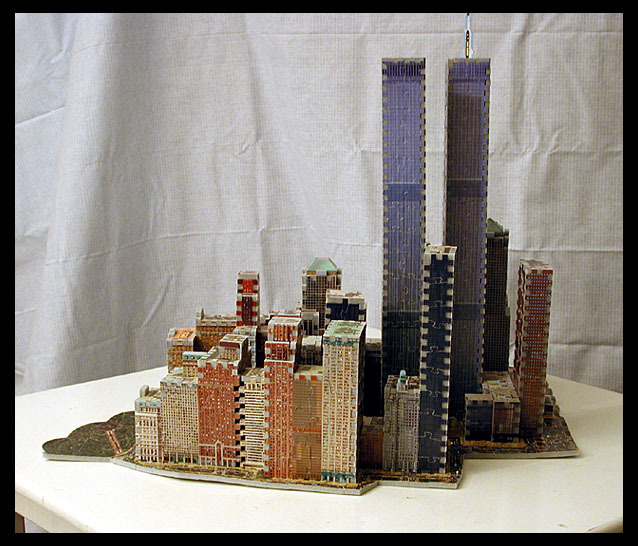 Because of this, I was able to take the 24 separate walls of the world financial center and get them together in the right way (I know what you’re thinking…4 buildings, 4 walls per building, 4 x 4 = 16…where did the 24 come from? Some of the walls are in two pieces because the buildings have different “levels”). I have moved the buildings off the table so that I can concentrate on the roof pieces. There are about 20-30 building pieces that I either don’t know what they are for, or that they can’t be joined until a roof piece is in place. The roof pieces are somewhat difficult since they don’t have a set shape (not all roofs are square…especially in this puzzle). I have several roof pieces done, and I have put together the first building with all of it’s roof pieces! Yay! 55 Water Street is complete. I have put together almost all of the roof pieces and attached them to the buildings. I have moved all of the buildings (with roof pieces) to the floor under the table to have room to start working on the base street pieces. Again, the manual is indispensable since it provides detailed illustrations of where pieces are supposed to attach to other pieces. I have the base street pieces all put together. 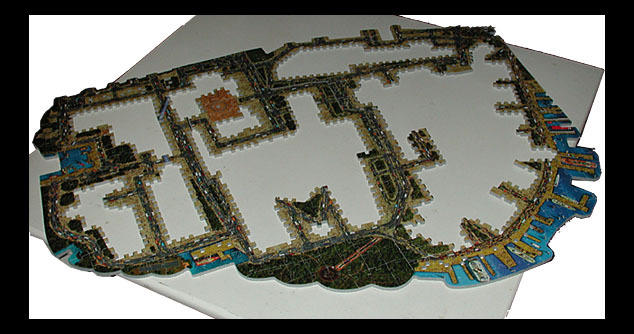 Now it’s time to put the buildings in their place, and the puzzle will be complete! 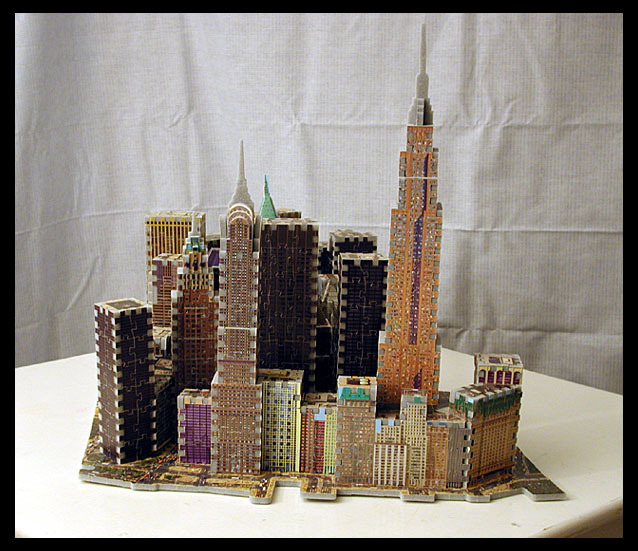 I put together the first group of buildings, and put them into the base street pieces. 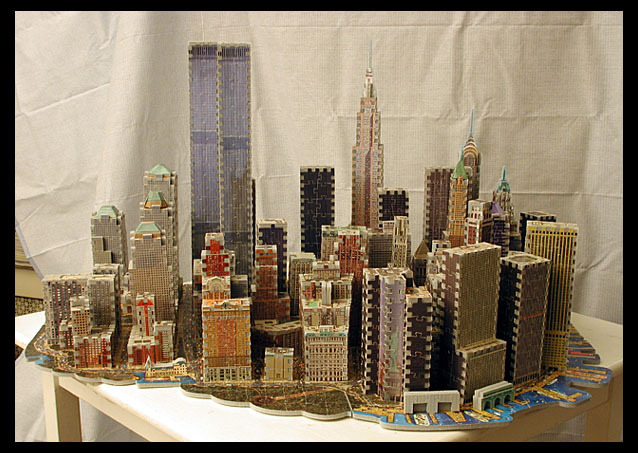 After that, the other buildings were easy, and pretty soon I had the world trade center district done.